BACKGROUND AND PURPOSE: The diagnosis of cerebral venous and sinus thrombosis (CVST) as a rare but important cause of stroke is challenging. We aimed to investigate the diagnostic value of multidetector-row CT angiography (MDCTA) as a fast and cost-effective imaging tool in diagnosing CVST. MATERIALS AND METHODS: Nineteen patients who presented with clinical symptoms of a possible CVST were included. All patients had received both MDCTA and MR imaging with venous MR-angiography. Three blinded readers were asked to identify the cerebral sinuses and veins in MDCTA and to evaluate the presence of CVST in MDCTA. Consensus reading with interpretation of the MR imaging served to establish the definite diagnosis. RESULTS: The consensus reading revealed CVST in 10 of the 19 patients. With MDCTA, the venous sinuses could be identified in 99.2% and the cerebral veins in 87.6% of cases. The sensitivity and specificity of MDCTA for the diagnosis of CVST were 100%. CONCLUSION: Our study demonstrates that MDCTA provides excellent sensitivity and specificity for the diagnosis of CVST. Further studies are needed to evaluate the diagnostic potential of MDCTA in specific subsets of the general entity of CVST such as cortical venous thrombosis, thrombosis of the cavernous sinus, and thrombosis of the internal cerebral veins. We therefore aimed to investigate the diagnostic value of multidetector-row CT angiography (MDCTA) in diagnosing CVST and compared it with MR venography as the reference standard that most closely reflects current practice. A data base search was performed to identify all patients who presented at our hospital with clinical signs and symptoms suggestive of a thrombotic occlusion of the cerebral veins or sinuses between June 2002 and December 2005. Inclusion criteria were signs and symptoms of suggestive CVST as stated by the referring neurologist (Table 1) and the performance of unenhanced CT, MDCTA, and MR imaging with venous MR angiography within 48 hours of symptom onset. Exclusion criteria were age less than 18 years, an inability to comply with either imaging method, and incomplete imaging protocols. Nineteen adult patients were identified. In 7 patients, an additional catheter DSA was also available. The average age of the patients included in the study was 50.1 ± 17.9 years (range, 22–81 years). Thirteen patients were female and 6 were male. Unenhanced CT and MDCTA were performed on a 4-, 16-, or 64-section multisection CT (Sensation 4, Sensation 16 or Sensation 64; Siemens Medical Solutions, Erlangen, Germany) under clinical routine conditions. Nine patients were investigated on the 4-detector system, 6 on the 16-row detector, and 4 on the 64-row detector system. As a standardized MDCTA protocol, the following parameters were used: 120 kV, 120–140 mAs, collimation = 4 × 1.0 mm, 16 × 0.75 mm, or 64 × 0.62 mm, respectively. Venous catheters (18 gauge) were placed in the antecubital vein in all patients. Contrast agent (120 mL) with an iodine concentration of 300 mg/mL was applied after a delay of 35 seconds. Depending on the size of the catheter, a flow rate between 3 and 5 mL/s was chosen. Care was taken to avoid catheter rupture, and a physician was present during the injection. Maximum intensity projections (MIPs) were created for the entire region of interest in axial, coronal, and sagittal orientations with an increment of 3 mm. MR imaging was performed on a 1.5T scanner (Magnetom Vision; Siemens Medical Solutions), including diffusion-weighted images (TR, 4200 ms; TE, 139 ms; section thickness, 5 mm; B-value, 1000), axial proton attenuation- and T2-weighted images, aquired as a dual-echo aquisition (TR, 2210 ms; TE1, 85 ms; TE2, 14 ms; section thickness, 6 mm), T1-weighted (TR, 665 ms; TE, 14 ms; section thickness, 6 mm), coronal fluid-attenuated inversion recovery (FLAIR) (TR, 7500 ms; TE, 74 ms; TI, 2500 ms; section thickness, 5 mm) sequence, and venous 2D time-of-flight (TOF) MR angiography (TR, 24 ms; TE, 5.6 ms; flip angle, 50°; section thickness, 3 mm) with superior arterial saturation pulses. DSA series were performed on a biplanar DSA-unit with an image matrix of 1024 × 1024 (Neurostar; Siemens Medical Solutions) including selective catheterizations of both internal carotid arteries and the dominant vertebral artery. Late venous phases were available in all DSA examinations. A standardized evaluation of the datasets was performed independently by 3 experienced readers, masked to all clinical data and patient identifying information except date of birth and examination date. Image interpretation was performed on a standard PACS workstation (Magic View VE42; Siemens Medical Solutions). Reading orders were randomized and a standardized evaluation form was used. First, the readers were asked to assess the cases regarding the presence of artifacts and the quality of contrast enhancement in the venous vasculature on a 5-point scale (5, no artifacts/excellent contrast; 4, few artifacts/good contrast; 3, moderate amount of artifacts/moderate contrast; 2, pronounced artifacts/poor contrast; 1, images uninterpretable because of artifacts/insufficient contrast). The readers were then required to state whether the overall quality of the images was sufficient for diagnostic evaluation. Subsequently, they were asked to identify and evaluate the following venous structures: superior and inferior sagittal sinus, straight sinus, transverse and sigmoid sinuses, internal cerebral veins, vein of Galen, anastomotic veins of Labbé, and basal veins of Rosenthal. In addition, the presence of prominent arachnoid granulations in the sinuses was noted as well, based on their typical appearance as round, well-circumscribed structures with the same attenuation as CSF. Next, the readers evaluated the dataset for the presence or absence of CVST. When a thrombosis was suspected by a reader, the involved sinuses and cerebral veins and, in addition, the presence of intracerebral venous infarction or venous hemorrhage, were noted. Moreover, other diagnoses were documented, if present. Finally, the diagnostic confidence about the presence or absence of a venous thrombosis was rated on a 5-point scale (5, absolutely certain; 4, very certain; 3 certain; 2, not very certain; 1, uncertain). In addition, readers were asked to state whether an additional imaging examination was required (yes/no) and, if yes, which technique they preferred (DSA or MR imaging). After having evaluated all MDCTA datasets, all readers performed a consensus reading of the unenhanced CT scan, MR imaging, and, if available, DSA with full clinical and outcome information on the patient to obtain a reference standard. All patient and image interpretation data were collected in a data base and analyzed with standard software (Excel and Access, Microsoft, Redmond, Wash). The consensus reading was used as a reference standard. Sensitivity and specificity parameters of MDCTA for the diagnosis of CVST were calculated. The reference standard consensus reading identified CVST in 10 patients. In 9 patients, no definite abnormalities were found in the cerebral veins or sinuses. Six patients had no pathologic intracerebral findings at all, 2 patients suffered from arterial infarctions, and 1 patient had undergone a previous craniotomy (for details concerning demographic data, clinical symptoms, and diagnosis, see Table 1). The overall image quality of the MDCTA examinations and their 3D reconstructions was rated suitable for diagnostic interpretation in 18 patients. One case was deemed insufficient by all 3 readers because of pronounced motion artifacts and was excluded from further analyses. Eighteen patients (54 readings) were judged suitable for further evaluation. The presence of artifacts was generally judged as low, with a mean score of 4.0 (ie, few artifacts). The vessel contrast in the veins was generally assessed as good with a mean score of 4.1 (ie, good contrast). On MDCTA, the readers were able to identify and evaluate the superior and inferior sagittal sinuses, the right and left transverse sinus, and the straight sinus in 100% (54/54 readings), the left sigmoid sinus in 96.3% (52/54 readings), and the right sigmoid sinus in 98.1% (53/54 readings; Fig 1). The internal cerebral veins could be identified and evaluated in 92.6% (50/54 readings), the vein of Galen in 98.1% (53/54 readings), the left vein of Labbé in 81.5% (44/54 readings), the right vein of Labbé in 79.6% (43/54 readings), and the left and right basal veins of Rosenthal in 90.7 (49/54 readings) and 88.9% (48/54 readings), respectively (Table 2). 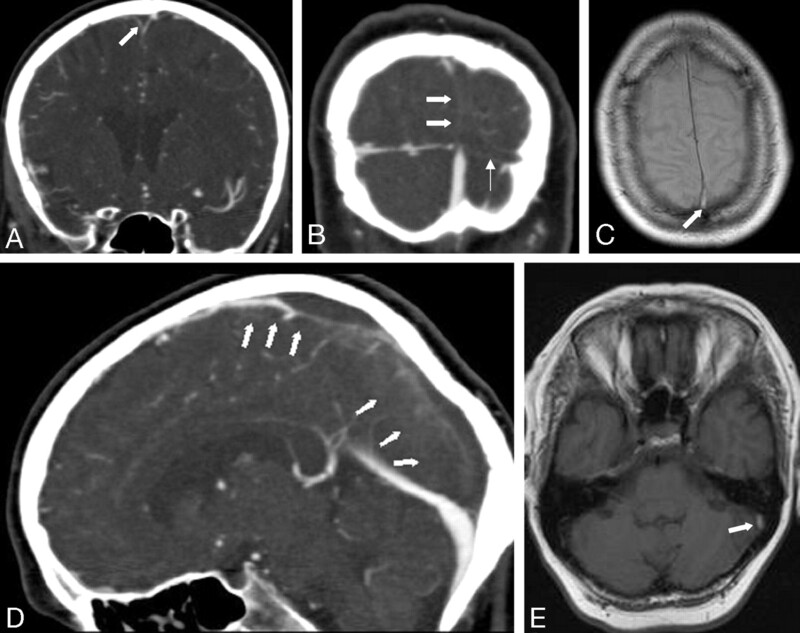 Sagittal (A) and coronal (B, C) sections of MIP reformations in a 22-year-old woman (patient 11) demonstrate the normal venous anatomy: superior sagittal sinus (thin arrow), the inferior sagittal sinus (arrowheads), the straight sinus (thick arrow), and the transverse sinuses (curved arrows). No venous pathologic condition was present in this patient. The MDCTA was performed on a 64-row-detector system. In the blinded evaluation of the MDCTA, a CVST was diagnosed by the readers in 27 of 54 readings. In most cases, more than one sinus was affected (Table 2): involvement of the superior sagittal sinus was noted in 18 of 54 readings (Fig 2) and involvement of the straight sinus in 2 of 54 readings. Thrombosis of the left transverse sinus was found in 10 of 54 readings, of the left sigmoid sinus in 3 of 54 readings (Figs 2, 3, and 4). The right transverse and sigmoid sinuses were found to be affected in 10 of 54 and 2 of 54 readings, respectively. Intracerebral venous edema and/or venous hemorrhage were noted in 7 of 54 readings (Table 3). Coronal (A, B) and sagittal (D) sections of MIP reformations of a MDCTA performed on a 4-row-detector system in a 54-year old woman (patient 10) with an acute thrombosis of the superior sagittal sinus (thick arrows) and the left transverse sinus (thin arrow) show filling defects in the respective sinuses. 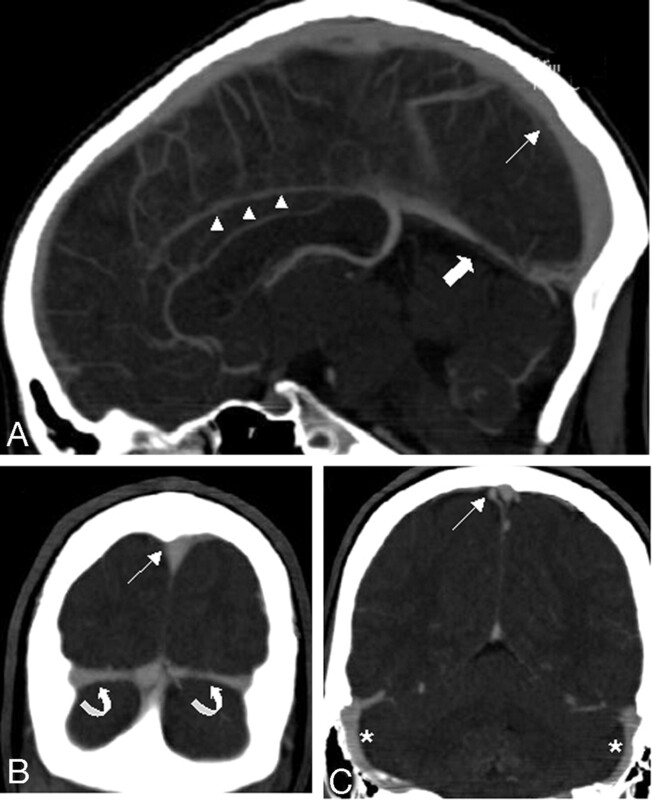 Axial T1- (C) and PD-weighted (E) MR images demonstrate hyperintense signal intensity in the thrombosed left transverse sinus (C, arrow) and the superior sagittal sinus (E, arrow). A 23-year-old male patient presenting with headache, amnestic aphasia, and visual disturbances (patient 4). MR imaging and MDCTA, performed on a 4-row-detector system, demonstrate a thrombosis of the left transverse (arrows) and sigmoid sinuses. A, Axial T1-weighted MR depicts hyperintense, thrombotic material in the left transverse sinus. B, C, 2D time-of-flight MR venography shows no flow void in the left transverse and sigmoid sinuses. D, Coronal sections of MIP reformations demonstrate a filling defect in the left transverse sinus. MDCTA and MR images of a 29-year-old female patient (patient 7) presenting with headache and seizures. Transversal sections of MIP reformations of the MDCTA (A, D) demonstrate filling defects in the left transverse (arrowheads) and sigmoid sinuses (arrow). 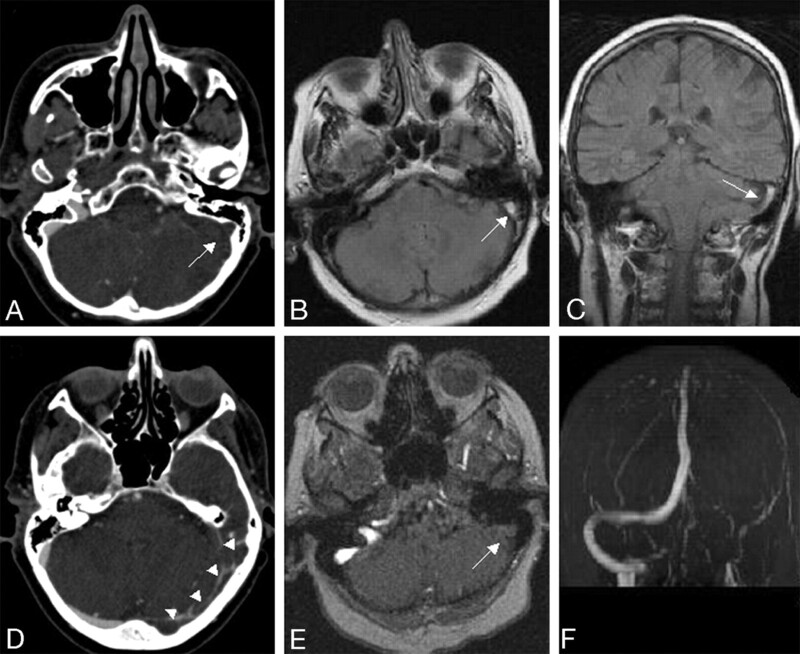 Axial PD-weighted (B) and coronal fluid-attenuated inversion recovery (FLAIR) images (C) depict hyperintense, thrombotic material in the left sigmoid sinus. E, F, 2D time-of-flight MR venography shows no flow void in the left transverse and sigmoid sinuses. There were no false-negative or -positive readings concerning the presence of a CVST in a patient. Thus, the sensitivity and specificity of MDCTA for the presence of a CVST was 100%. Although the readers agreed on the overall presence of a CVST, they varied in some cases in the evaluation of the extent of the CVST (Tables 2 and 4): 9 of a total of 741 evaluated veins and sinuses were rated false-negative, and 4 of 741 were rated false-positive concerning the involvement in a CVST. A CVST was correctly identified in 45 of the 741 evaluated veins and sinuses. The mean diagnostic confidence about the presence or absence of a CVST was rated as 4.4 (very certain). Readers desired an additional imaging examination in 8 of 54 readings (Table 3). In 9 readings (3 patients), the readers found diagnoses other than CVST (infarction in the territory of the right middle cerebral artery in 2 cases and postoperative state with osteoplastic trepanation in 1 case). Eighteen of 54 studies were rated as normal; prominent arachnoid granulations as normal variants were noted in 16 of 54 readings (Table 3). The diagnosis of CVST has traditionally been made with conventional angiography (DSA).13,19 More recently, DSA has been superseded by MR imaging techniques as the method of choice. MR imaging with MR venography is now commonly considered the noninvasive “gold standard” in diagnosing thrombosis of the cerebral venous sinuses2,5,7,8,20–23 and also dominates the diagnostic arms in large international trials.6 However, because CT is still the technique of choice to rule out intracranial hemorrhage in most institutions, it is tempting to assess a CVST by using the same technique. Therefore, we propose MDCTA as an alternative diagnostic measure in CVST, which is faster, more widely accessible, and more cost-effective than MR imaging. In the last decade, the role of CTA has increased tremendously with the advent of MDCTA, which enables a high spatial as well as a high temporal resolution.16–18,28–30 Because of an increased spatial resolution in the z-plane, the aquisition of isotropic voxels became feasible, thus offering the option of high quality multiplanar and 3D reformations. So far, the role of CTA in the diagnosis of CVST has only been evaluated in a few small series.14,24–27,31 To the best of our knowledge, the diagnostic value of MDCTA in this disease has not been studied systematically and in a blinded fashion before. We used sliding-thin-slab maximum intensity projections (STS-MIP) in the postprocessing because recent data on MDCTA recommend this reformation technique for the evaluation of cerebral veins and arteries.36 3D reformation techniques, such as volume-rendering techniques might further increase the diagnostic value of the MS-CTA.36,37 However, we propose STS-MIP reformations for routine clinical settings because they are widely available and can be created directly at the scanner console in a short time span.36 Moreover, the cross-sectional nature of the data remain preserved in the STS approach. In addition, this approach facilitates the viewing of the entire dataset by scrolling through the cross-sectional slabs, whereas data are lost in the cleavage process of volume-rendering techniques. Published data on MR evaluation of the cerebral veins are conflicting. While Ayanzen et al32 found the vein of Galen and the internal cerebral veins in every MR venography and the basal veins of Rosenthal and the anastomotic veins of Labbé in more than 90%, others found a low sensitivity of TOF-MR venography for small vessels, especially those with slow flow.33,38,39 We performed 2D-TOF MR venography in our study because it is most widely used in clinical routine settings. Promising new MR and MR angiography techniques such as multiphase contrast enhanced MR angiography at 3T40 might further improve the value of MR in the evaluation of the cerebral veins and sinuses. In our study, MDCTA reached 100% sensitivity and specificity in the diagnosis of a CVST. These data suggest that MDCTA might be at least equivalent to MR imaging with MR venography in the diagnosis of a thrombosis of the cerebral sinuses.5,14 We included no cases with CVST involving the deep cerebral veins in this study. Furthermore, the cortical veins were not analyzed in this study. Thus, further studies are now needed to evaluate the diagnostic potential of MDCTA in specific subsets of the general entity of CVST, such as cortical venous thrombosis, thrombosis of the cavernous sinus, and thrombosis of the deep cerebral veins. Drawbacks of MDCTA are the irradiation doses arising from this examination and the risks of contrast nephropathy. However, analysis of radiation doses have shown that the radiation dose of a MDCTA performed with 120 kV is less than 1 mSv (less than the mean effective dose of an unenhanced CT scan).44 Special attention must be drawn to contraindications to iodinated contrast media, such as a known allergy to iodinated contrast agents, elevated renal function tests, or hyperthyroidism. Special attention must be drawn to 2 possible sources of false-negative results in detecting a CVST in MDCTA. First, in the acute setting, a spontaneously hyperattenuated clot could be mistaken for an enhanced sinus; this phenomenon is referred to as the “cord sign.” Data in the literature concerning the presence of this “cord sign” are somewhat contradictory. 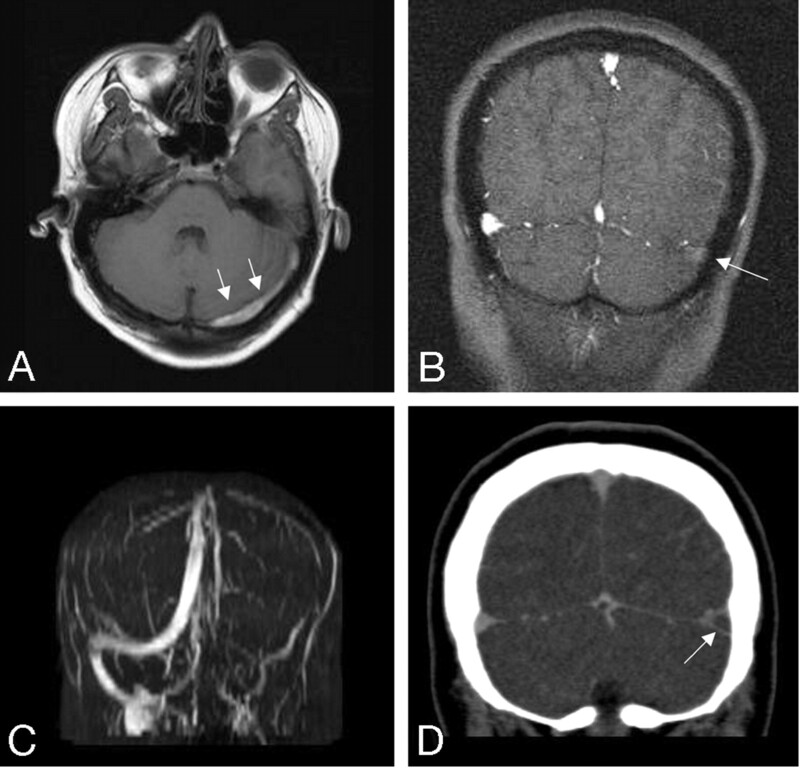 Although some investigators found the cord sign signifying acute thrombus in 56% patients with CVST who underwent unenhanced head CT,12 in a similar study, the thrombus was demonstrated in only 25% cases on unenhanced CT scans.45 To assess this problem as a source of false-negative results, it should be absolutely recommended to analyze the unenhanced CT as well as the MDCTA images to establish the diagnosis of a CVST. Second, in the chronic state of a CVST an older, organized clot can show enhancement after contrast administration and may not produce a filling defect and might thus be missed. Some limitations of our study need to be taken into account when interpreting the data. First, the sample size of our study was relatively small. Because of this limited number of patients, we could not compare the different scanners or look for significant differences between 4-, 16-, and 64-MDCTA examinations. However, CVST is a rare disease, thus rendering the recruitment of large patient populations difficult, and because the 19 patients were assessed by multiple blinded reads, this may not necessarily limit the scope of our observations. Our data should serve as the basis for larger, possibly multicenter studies. In addition, all readings were performed using only the MDCTA and not a corresponding unenhanced cranial scan. We chose this approach to concentrate on the relative diagnostic value of the CTA itself and to minimize potential confounding factors. However, in the routine clinical situation, an unenhanced cranial CT scan is usually available as well, which may further enhance the diagnostic potential of MDCTA and minimize the number of false-negative results. This study demonstrates that the cerebral venous sinuses can be easily and confidently visualized with MDCTA. MDCTA was found to have high sensitivity and specificity parameters in diagnosing thrombosis of the cerebral sinuses. We propose that MDCTA is a fast, widely accessible, and cost-effective alternative to MR imaging, especially in the emergency setting, if MR is not feasible or in cases in which the results of MR are ambiguous and there is still a clinical suspicion of CVST. Accepted after revision August 13, 2006.